MENS SHIRT SIZE 16. MADE BY ETON.BLUE & WHITE STRIPES WITH WHITE COLLAR & DOUBLE CUFFS. Condition is Used. Dispatched with Royal Mail 2nd Class. If you've never bought an Ozwald Boateng shirt before, they are long in the body. You won't have any issues with it coming un-tucked. Colour is light purple. Classic Chisel Tip Collar. Purple blue grey striped shirt. Cufflinks required to fasten cuffs. Fun lining to collar and cuffs. Good condition TM Lewin long sleeve shirts. 16in collar, long sleeves. Not worn a great deal as bought for work but now have issued work clothes so no longer required. Thomas Pink Button up shirt for sale. Colour blue. Shirt has been tried on, but never worn. Perfect condition. Colour: Blue Striped. Pure Cotton. Cost £35 (price is shown on box). 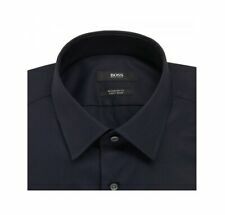 Nina Ricci Shirt Mens (39/15.5). Condition is New with tags. Came from menswear boutique now collar 16 European 41-4cms collar. Chest 46"(approximate) Arm pit to arm pit : 22". Sleeve length: 27" (from shoulder). Collar size : 16" (approximate). Shirt is made out of 100% cotton. NEXT - Men’s Check Slim Fit Shirt With Tie - 16” - RRP £24 - New !!! 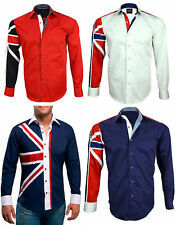 NEXT - Men’s Check Slim Fit Shirt With Tie - 16” - RRP £24 - New !!!. Condition is New with tags. Dispatched with Royal Mail 2nd Class. 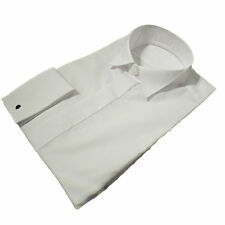 MENS NEW PLAIN WHITE REGULAR COLLAR COTTON WEDDING DRESS SHIRT 14 15 16 1/2 "
100% Authentic GUCCI Grandad Collar Blue Striped Cotton & Silk Shirt - 16 / 41 - New. 100% Cotton - woven. White and blue stripes. Shoulder to shoulder - 17". Shoulder to hem - 29". Sleeves - 26". Zilli Mens Lightweight Cotton Dress Shirt in Blues & White Neck Size 16/41. Condition is New with tags.